Some refer to the Akoya pearl as the "icon" of cultured pearls. These beautiful and classic black Akoya pearl earrings is a staple of exquisite pearl earrings and is sure to be a favorite of yours for years to come. These beautiful pearls are attached with a 14K Gold posts available in both yellow and white gold. 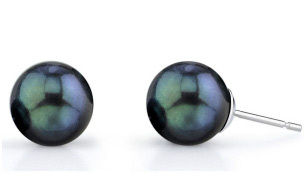 We guarantee our 6.5-7.0mm Black Akoya Pearl Stud Earrings to be high quality, authentic jewelry, as described above.